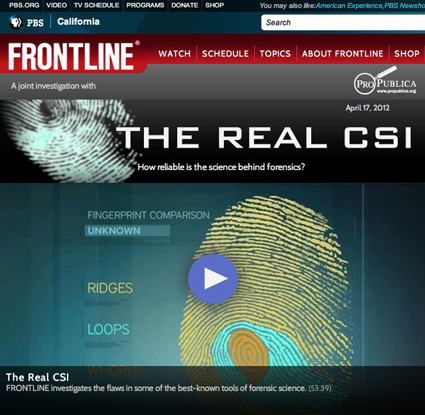 FRONTLINE, PBS.org; THE REAL CSI: How reliable is the science behind forensics? by Leah Bartos, Special to ProPublica April 17, 2012, 11:30 a.m.
April 19: This story has been corrected. This is how I — a journalism graduate student with no background in forensics — became certified as a “Forensic Consultant” by one of the field’s largest professional groups. One afternoon early last year, I punched in my credit card information, paid $495 to the American College of Forensic Examiners International Inc. and registered for an online course. After about 90 minutes of video instruction, I took an exam on the institute’s web site, answering 100multiple choice questions, aided by several ACFEI study packets. As soon as I finished the test, a screen popped up saying that I had passed, earning me an impressive-sounding credential that could help establish my qualifications to be an expert witness in criminal and civil trials. For another $50, ACFEI mailed me a white lab coat after sending my certificate. For the last two years, ProPublica and PBS “Frontline,” in concert with other news organizations, have looked in-depth at death investigation in America, finding a pervasive lack of national standards that begins in the autopsy room and ends in court. Expert witnesses routinely sway trial verdicts with testimony about fingerprints, ballistics, hair and fiber analysis and more, but there are no national standards to measure their competency or ensure that what they say is valid. A landmark 2009 report by the National Academy of Sciences called this lack of standards one of the most pressing problems facing the criminal justice system. Over the last two decades, ACFEI has emerged as one of the largest forensic credentialing organizations in the country. Among its members are top names in science and law, from Henry Lee, the renowned criminalist, to John Douglas, the former FBI profiler and bestselling author. Dr. Cyril Wecht, a prominent forensic pathologist and frequent TV commentator on high-profile crimes, chairs the group’s executive advisory board. But ACFEI also has given its stamp of approval to far less celebrated characters. It welcomed Seymour Schlager, whose credentials were mailed to the prison where he was incarcerated for attempted murder. Zoe D. Katz – the name of a house cat enrolled by her owner in 2002 to show how easy it was to become certified by ACFEI — was issued credentials, too. More recently, Dr. Steven Hayne, a Mississippi pathologist whose testimony helped to convict two innocent men of murder, has used his ACFEI credential to bolster his status as an expert witness. Several former ACFEI employees call the group a mill designed to churn out and sell as many certificates as possible. They say applicants receive cursory, if any, background checks and that virtually everyone passes the group’s certification exams as long as their payments clear. Some forensic professionals say the organization’s willingness to hand out credentials diminishes the integrity of the field. Robert O’Block, ACFEI’s founder, vigilantly defends the group’s work, saying it has helped make forensics more accessible. He told ProPublica and PBS “Frontline” that the ACFEI credentials are not designed to qualify experts in court and emphasized only a judge can make that determination. O’Block also said he’s been unfairly criticized by other professional groups that compete with ACFEI in certain regards, including the AAFS, Weedn’s group. The judges who must determine whether to qualify a witness as an expert face an alphabet’s soup of organizations with differing standards. Some, like the American Board of Criminalistics, vet members extensively, requiring them to pass intensive board exams to demonstrate their skills. Others, as noted in the NAS report, are far less stringent. Experts in the field worry that inconsistent standards and training for forensic examiners can lead to miscarriages of justice — to the guilty walking free and the innocent being locked up or worse. “There are a lot of people practicing, but there’s no assurance that they have the requisite training and board certification to see if they do have the skills to do the practical [work],” said Dr. Marcella Fierro, one of the NAS report’s authors and the former chief medical examiner of Virginia. Under state and federal rules of evidence, judges decide whether prospective expert witnesses can testify, but they sometimes rely heavily on the titles and letters around someone’s name. O’Block, 60, founded the organization that grew into ACFEI in Branson, Mo., in 1992, after being rejected for membership by a credentialing organization for forensic handwriting experts. O’Block launched his first credentialing programs while teaching criminal justice at the College of the Ozarks. Initially, the fledgling operation offered correspondence certifications in forensic document examination and behavior profiling for $100 apiece. Over time, the organization expanded its offerings, adding dozens of courses to certify applicants in various aspects of forensics, from counseling to nursing to accounting. Applicants must become members of ACFEI to become certified; on top of my course fee, I paid $165 in membership dues. O’Block also founded related associations that offer credentials in other fields, including psychotherapy and integrative medicine. One, the American Board for Certification in Homeland Security, attracted a powerful new client: the Defense Department. Since 2008, the U.S. Navy has paid more than $8.5 million for sailors to obtain credentials in such specialties as “Disaster Preparedness” and “Sensitive Security Information” through a program separate from the one for forensics. Today, there are two entities that go by the ACFEI acronym — the original, which is a non-profit, and a related for-profit company called the American College of Forensic Examiners Institute of Forensic Science. O’Block is president of both and, according to tax filings, received total compensation of more than $430,000 in 2010. ACFEI and its related entities have continued to expand under O’Block’s leadership, growing to about 20,000 members combined, despite periodic controversies. In 1998, when ACFEI proposed offering an online doctorate in forensic science, dozens of forensics professionals and educators wrote to the Missouri Board of Higher Education to protest the plan. “The questions are suitable for a grade school child,” wrote one. ACFEI dropped its application. Then, in 2002, the story broke about the cat. O’Block remains vexed by what he calls a “stunt” orchestrated by a member of a competing professional organization. “First of all, ACFEI did not certify a cat…[It] certified a human being who used fraudulent credentials and called himself Dr. Katz,” O’Block wrote in an email. Since then, O’Block said, ACFEI has changed its verification process, requiring applicants to submit multiple professional references and be placed on provisional status while their application is pending. Two days after I passed the Certified Forensic Consultant exam, I received an email from ACFEI asking me for additional materials. I emailed the group my references, a resume and a scanned copy of my college diploma. Less than an hour later, I received an email saying I could start using my forensic consultant designation. None of my references was contacted by the group. According to a statement provided by ACFEI’s attorney, that step was deemed unnecessary in my case. Among forensic professionals, there continues to be fierce debate over the quality of ACFEI’s courses — and what being certified by the group actually signifies. ACFEI advertises itself as an educational institution and markets its certificates as building up holders’ value as witnesses in court. Expert witnesses are typically paid for their testimony. But both O’Block and Wecht, the group’s official spokesman, stressed that ACFEI certificates alone don’t make you an expert. But ACFEI is not recognized as an accredited institution of higher learning by Missouri, where it is incorporated, or by the U.S. Department of Education, which maintains a registry of accredited schools. A number of organizations, such as the California Board of Registered Nursing and the American Psychological Association, recognize ACFEI as a provider of continuing education. But that’s not the same as institution-wide accreditation, said Leroy Wade, the Assistant Commissioner of the Missouri Board of Higher Education. Several former ACFEI staffers say they came to question how the group writes and administers its exams. John Bridges was hired as ACFEI’s president and chief executive in 2010 after decades in government, most recently as an administrator at the Federal Emergency Management Agency. He left ACFEI after just nine months, frustrated, he says, by the group’s practices. “Based on my perception of what went on related to standards and quality, it operated like a certification mill,” he said. Though ACFEI offers both basic courses and more advanced, specialized certificates, Bridges said, its exams are designed so that anyone can pass. He put the failure rate at less than 1 percent. O’Block initially said that ACFEI did not keep pass/fail rates for its exams. Later, the group’s attorney said it did keep such statistics, but he did not provide them upon request. Other former employees said it was routine for low-level staffers to write exams for ACFEI and its related organizations based on textbooks in subject areas in which they had no expertise. Tania Miller worked for six months as chief association officer for the American Psychotherapy Association, an ACFEI sister group, beginning in fall 2010. A few weeks into her job, she said, she was asked to author an exam to certify forensic counselors. Miller’s background was in marketing and graphic design. She said she declined to write the exam. ACFEI did not respond to questions about Miller. ACFEI did not answer questions about what level of expertise it requires of those who write its exams. According to its catalog, some of the exams are authored by prominent specialists, including Wecht. O’Block vehemently denies that ACFEI is a diploma mill, saying the group has thousands of satisfied members. He has filed five lawsuits in the last year against individuals — mostly bloggers — who have posted statements O’Block claims are defamatory about his organizations. One is pending. The others have been dismissed by courts or at the parties’ request after bloggers agreed to take down posts. Wecht, whose signature appears on some ACFEI certificates (including mine), said he didn’t know how applicants did on the group’s tests, but emphasized that the group’s program is mostly about fostering enthusiasm for the field. “The purpose of the organization is to encourage people who are interested in forensic science to learn more, to study more,” he said. To critics, the greatest concern about ACFEI is the potential that the organization is giving legitimacy to expert witnesses who don’t warrant it. Among the thousands of people that ACFEI has certified is one particularly controversial expert in forensic pathology: Dr. Steven Hayne. Hayne, the longtime pathologist for the state of Mississippi, performed the autopsies in two shocking 1990s cases in which three-year-old girls were abducted, sexually assaulted and murdered. In both cases, Hayne testified he had observed bite marks on the young girls. He said he had called in a forensic dentist who confirmed that the marks were human and matched them to dental impressions from the defendants in each case. These findings aided in the convictions of Levon Brooks for the first murder and of Kennedy Brewer for the second. Brooks was sentenced to life in prison. Brewer was sentenced to death. After the men spent more than 30 years combined incarcerated, the Innocence Project recovered DNA evidence that led investigators to the real killer. He confessed to both crimes, but denied biting the victims. Hayne no longer conducts autopsies for the state, but continues to give testimony as an expert witness. Testifying in March 2010 in Lamar County Circuit Court, Hayne was asked what board certifications he held. “I’m board certified in anatomic pathology, clinical pathology, forensic pathology and forensic medicine,” he replied. Hayne has credentials in anatomic and clinical pathology from the American Board of Pathology, considered the gold standard, but not in forensic pathology, the branch of medicine focused on the mechanics of death. For that, he cites his Certified Forensic Physician credential from ACFEI and certification in forensic pathology from the American Academy of Neurological and Orthopaedic Surgeons. When attorneys for the Innocence Project submitted a wide-ranging complaint about Hayne to the Mississippi board of licensure, they cited Hayne’s reliance on these organizations to allege he had misrepresented his credentials. “Certification by these organizations is not at all what the medical community and public understand when a doctor claims to be ‘board certified,'” the complaint said, referring to ACFEI and the other group. Citing ongoing litigation, Hayne declined to be interviewed by ProPublica and PBS “Frontline” beyond confirming that he is certified by ACFEI. He has sued the Innocence Project for defamation in the U.S. District Court for the Southern District of Mississippi. Wecht acknowledged he knew of Hayne by reputation, but told ProPublica and PBS “Frontline” that he had not known Hayne was certified by ACFEI. In its 2009 report, the National Academy of Sciences called for several measures to address systemic flaws involving forensic examiners and expert testimony. Certification should be mandatory for forensics professionals and should be overseen by a centralized credentialing agency, the report said. One of the report’s primary authors, Harry T. Edwards — a federal appeals court judge for the District of Columbia – said these changes were critical to imposing rigorous standards on the field.. Despite the controversies that dog it, ACFEI may aspire to fill that role. In a promotional video filmed after the NAS report’s release, Wecht said its findings presented the group with a unique opportunity. I’ve never tested whether my $495 forensic consultant credential from ACFEI would carry any weight on the witness stand. Wecht said he doubted that having the certificate on my resume would be enough to persuade a court to allow me to give expert testimony. Any decent lawyer, he said, could easily cast doubt upon my qualifications. Leah Bartos graduated from UC Berkeley Graduate School of Journalism in May 2011. Since then, she’s been a reporter-in-residence at the Investigative Reporting Program at UC Berkeley. Andrés Cediel, the producer of PBS Frontline’s “The Real CSI” and Lowell Bergman, the film’s correspondent, contributed to this report. 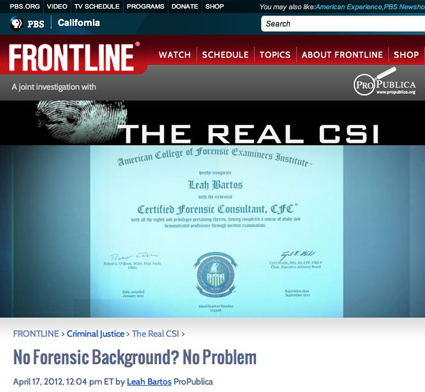 Update (4/19): ACFEI has posted a response to our collaboration with PBS “Frontline” on its website. It defends the value of the group’s programs and says the pass rate on ACFEI exams is 86 percent. Correction: This story identified Henry Lee as a pathologist. Lee has a PhD in biochemistry, but is not a medical doctor.